Off the north end of Arapawa Island in Cook Strait lie a group of islets known as The Brothers. In Maori tradition, these are Ngawhatu Kai-ponu: ‘the eyeballs that stand witness’, the eyeballs of Whekenui, the giant octopus Kupe killed in Tory Channel, placed in the Strait to bear witness to his victory and form beacons of dangerous waters. Old-time Maori when crossing Raukawa (Cook Strait) would shade their eyes with leaves to prevent ill fortune until past these rocks. Captain Cook’s Endeavour nearly foundered on The Brothers, due to the strong tides running through the Strait – a longboat was put down for the sailors to tow the ship to safety, but fortunately the tide changed in time for him to sail away. Brothers Islands Lighthouse. Picton Historical Society. In colonial times it was decided to build an English-style lighthouse on The Brothers, which proved to be a difficult job. It took 60 days merely to land the necessary equipment and men, then the builder and his working party remained on the exposed rock for the best part of a year, arduously winching every ton of building material and stores up to the site. Then came the even trickier task of landing the more fragile lantern with its lenses and light apparatus, and to haul it to the summit. The light was first switched on in the lighthouse on 24 September, 1877. In August 1954 it was changed over from kerosene to electric power. Power was supplied by three 10 H.P. diesel engines coupled to three 6.8 k.w. generators, with only one of these running at any one time, while the other two were kept in reserve. The changeover to electricity did not affect the character of the light or its flashing in any way. During these years lighthouse keepers were in residence on The Brothers. They received their stores by ship from Picton, and sent off a weather report on local conditions at 4:30 am daily, then every hour on the hour till 4 pm. Many local people had contact with the lighthouse: apart from the Keepers, there were the crews of Enterprise I & II, the supply launches. Dale Connor worked on the first one for some time. ‘Every fortnight you’d take out coal, meat, all the stores, all that side of it, diesel fuel. Out at Koromiko, the little shop out there that’s now closed used to be owned by Leo Fields. He’d been a lighthouse keeper, and he used to supply all the groceries and that for The Brothers,’ he said. Jim Cook was sometimes taken out by helicopter for emergency electrical repairs. Once a year a nurse from Picton went out to check all their First Aid and medical equipment and all their drugs and medications. Dawn Woodward (formerly Whyte) when District Nurse, did the last service before automatic lights were installed and men no longer lived on the site. Brothers Islands Lighthouse. The Enterprise unloading supplies. Picton Historical Society. Click image to enlarge. ‘I regarded that as one of my most memorable journeys,’ she told me. ‘At The Brothers there is no way of mooring the boat or tying it up to a jetty, as it’s just a pile of rocks in the middle of Cook Strait with very strong currents and tides. And so while the boat is unloading, they have a crane on the shore, on a reasonably flat piece of ground, and they use nets for the cargo and a box like a tea-chest to put people in. The captain spends the whole time just moving the boat backwards and forwards keeping it away from rocks and currents and as smooth as possible so they can unload and reload the ship. It takes some time, and when it comes your turn to go ashore, they say, “When I say Go, get in the box and keep your head down.” And then they swing you across the ocean and on to this little concrete platform, and there you are. The seamanship displayed that day was excellent, and needed close cooperation of the crane operator on shore.’ The ship was Enterprise II. Her captain was David Williamson and crew members were Barry Nitz and Bernie Olsen. 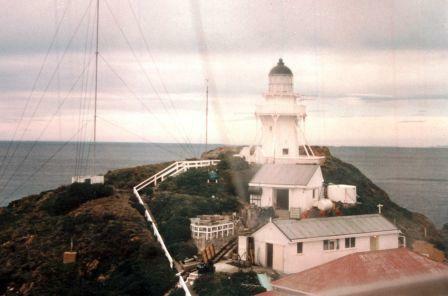 In March 1990, the automation of The Brothers Lighthouse marked an end of the era of resident keepers. The last keepers were Tim Watson, Ian Hargreaves, Bill Megennis, and Charlie Wills.